Today, I'm off in the hills taking a Wilderness Medicine course with the Boy Scouts, but I already know from previous experience that I won't have phone reception where I'm going, so I can't check in and comment until very late Saturday. Therefore, I've pre-posted the contest today. Have fun! It looks like a picture off a bill so i'll guess Salmon Chase. That is an excellent clue Judi. If not Chase, is it Sam Houston? 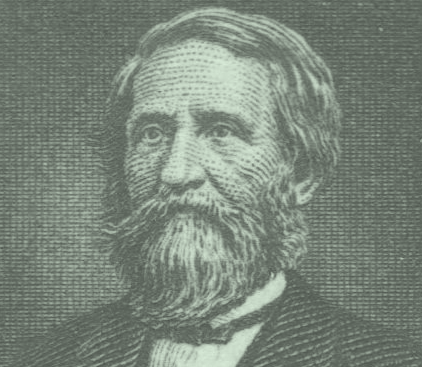 Charles Henry Dow, founder of the Wall Street Journal and the Dow Jones Industrial Average. Not a bill but a Postage stamp portrait...Dr Crawford Long - first to use ether on a patient. Yep. I take my guess of Charles Dow. It is indeed Dr. Crawford Long. That's the image used on a stamp issued in 1940. I had the same idea as Judi, but knew there were no US bills with that picture on it. Good job, Michael. Glad I could throw out a clue since I knew it looked nothing like Chase, but wanted to make some kind of comment & I don't know stamps. It took quite a while to find him on the stamp.